Micro Layouts are small model railroads and are a sub-genre of model railroading that lends itself well to small bite-size projects. Small Layout Scrapbook has been around for many years and is a great source for these layouts. They present great opportunities to make dramatic scenes. 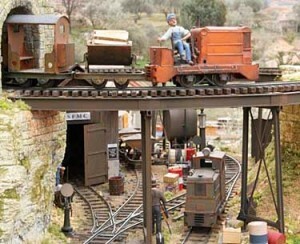 This is a small mining layout that can be found at the Small Layout Scrapbook called Draversaz built in 1:48 “O” scale and is only 24 x 18 inches in size. One of our students, built this micro layout for his project a couple years ago. We ended up making it 11 x 41 inches in size and it is HO scale with a small trestle and a tunnel. More about this project can be found here. This entry was posted by Dan Swearingen on Tuesday, August 10th, 2010 at 3:05 pm	and is filed under Project Ideas. You can follow any responses to this entry through the RSS 2.0 feed. Both comments and pings are currently closed.